Last week I covered Midtjyllands prowess from corners, but they also scored 7 goals from free kicks not shot straight at goal. Below I analyse how they scored so many to claim the crown of set-piece taking. 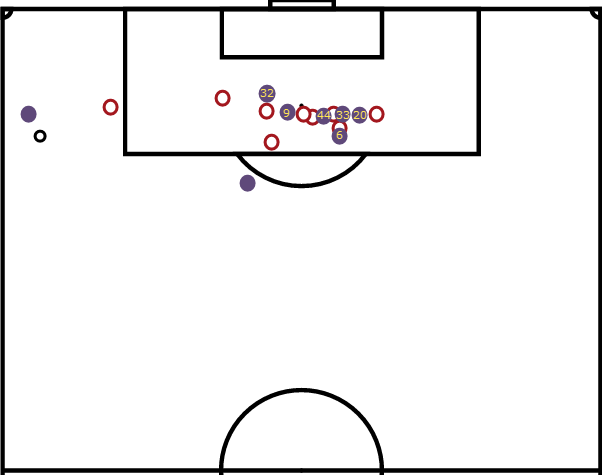 Midtjylland start a lot further away from the box than most teams would for a free-kick in a similar situation, when the ball is played into a dangerous area (edge of the 6 yard box) every player makes a run in. As discussed in previous episodes, this is a very efficient tactic as the slightest touch on the ball will end up with a very high chance of scoring a goal – and is much harder to defend such a ball than it is to attack it thus giving a huge advantage to the attacking team. Plenty of movement keeps the defenders occupied and the spacing between the players means there’s a good likelihood of the ball finding a Midtjylland head. I’m not entirely sure whether the ball was intended to land where it did, but that shows the effectiveness of planning players positions and movement at set-pieces. Pretty much the exact same goal as the goal against Sonderjyske discussed above but from the opposite side of the pitch. Exact same principles at work! This is a fascinating and very well worked free kick and shows how effective player movement and anticipating how opponents will react to a certain situation can be. Frederik Moller (number #35) makes a decoy run, running himself off-side (his marker realises he’s run offside so doesn’t follow him). The ball is then played short to Izunna Uzochukwu (#43) who finds himself in space. This then creates an overload as Moller’s marker picks up Uzochukwu, leaving Moller free in space (and back onside). He takes it to the byline as players flood into the box for a simple tap-in. A fantastically executed free kick. Whilst this was a direct free-kick, I thought it worthy of inclusion as it was obviously well thought out and had a plan other than simply taking a shot. The Midtjylland players form a wall behind the defensive Nordsjaelland wall. As the kick-taker (in this case Pione Sisto who has now moved to Celta Vigo) makes his run up the Midtjylland wall makes a run forward. This obviously makes it ridiculously hard for the goalkeeper to be able to track the flight of the ball and a previously saveable free kick now results in a goal. This throws up an interesting question – why don’t more teams do this when the free kick taker is obviously going to shoot? It gives a small difference, but as we’ve examined so far this series, taking advantage of small gains like this can be the success and failure. Again a free-kick in a similar situation to 2 others we’ve looked at. Ball whipped in towards the 6 yard box that meets the on-rushing players with a simple touch on the ball sending it past the helpless keeper. As above, but nobody gets a touch on it and the free kick goes in! 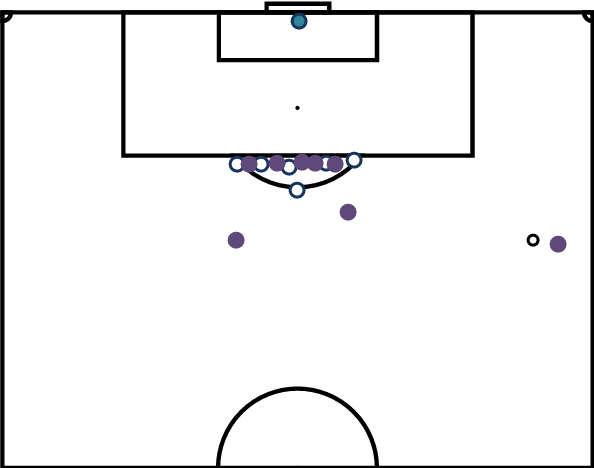 Exact same situation and scenario as the others, free kick whipped into the dangerous area with a bunch of Midtjylland players ready to meet it. Just like with their corner routines examined previously it’s very obvious that Midtjylland practice and put a lot of work into set-pieces. Each player’s positions look to be carefully spaced out and planned in order to give them the highest chance of scoring and it worked, winning them their first title in their history. It’s telling that the analytical team behind the focus on set pieces were let go a couple of years ago and Midtjylland have yet to win another title. I’ve said it before and i’ll keep on saying it- set-pieces are hugely under-rated.